An alligator in the water. If you live in Florida or have spent time here, then you have probably already seen an alligator or two, though mostly likely in a zoo or park and from the safety of a fence. While you are far less likely to encounter an alligator in the wild, it’s always good to be prepared, just in case. 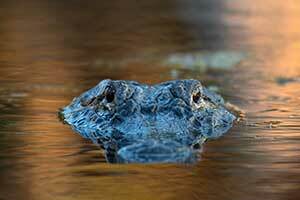 Don’t swim at night, and especially at dusk or dawn, when alligators are known to feed. Stay out of any body of water unless you are completely certain that it’s safe. Do pay attention to any posted warning signs of alligators in the water and avoid swimming where there is a known danger. If you are unfamiliar with the area, ask locals and residents who are familiar to guide you to safe, heavily populated swimming zones. Don’t feed alligators, as it teaches alligators to associate human beings with food and grow increasingly comfortable in human environments. If that doesn’t scare you, it’s also illegal and can earn you a hefty fine. Do respect boundaries between wildlife and human beings. Observe and enjoy alligators from a safe distance, but avoid any interactions that can be potentially dangerous for either of you. Don’t attempt to move or catch an alligator on your own. Alligators become dangerous when 4 feet or more in length, and you could be putting yourself right in the line of danger. Do report a wild alligator siting to the proper authorities if it is posing a potential threat. This generally means contacting your local Florida Fish & Wildlife Conservation Commission office. Don’t approach the alligator. If there are any pets or small children in the area, place them inside if possible or keep a close eye on them. Do keep within a safe distance from the alligator. Alligators can run very fast for short distances, so it’s wise to stay at least 30 feet away. Don’t run away in zig zags if an alligator is chasing you. This is a myth and running this way will likely only wear you out faster, not the alligator. Do back away from an alligator slowly if you find yourself close to one. For the most part, alligators are more scared of humans than we are scared of them, and are very unlikely to chase you. Don’t ever get in the water with an alligator, even a small one. Alligators are at their strongest when in the water, and you increase your chances of attack greatly if you join them on their turf. Do keep a close eye on any alligators you come across, and watch for any warning signs of aggression. If an alligator hisses at you, then an attack may follow shortly. South Florida is a beautiful place, and part of what makes it beautiful is all of the unique and interesting animals that share the area with us. While some animals, like alligators, can be dangerous in certain situations, as long as we respect them and their territory, we can all live together in harmony. If you’d like to view alligators and other fascinating creatures in an exciting, yet perfectly safe, environment, consider an airboat tour through the Everglades. Airboat rides are safe for the whole family, and are sure to leave you with a memory of Florida that you never forget. Previous story Why Do Snakes Shed Their Skin?